Well, I hope this game gets off the ground tomorrow - my buddy Pat wants to try out his Ancient naval rules he so diligently drafted this past week; after the game I hosted last Friday. Incidentally, I couldn't make today's Truants game due to some other commitments. 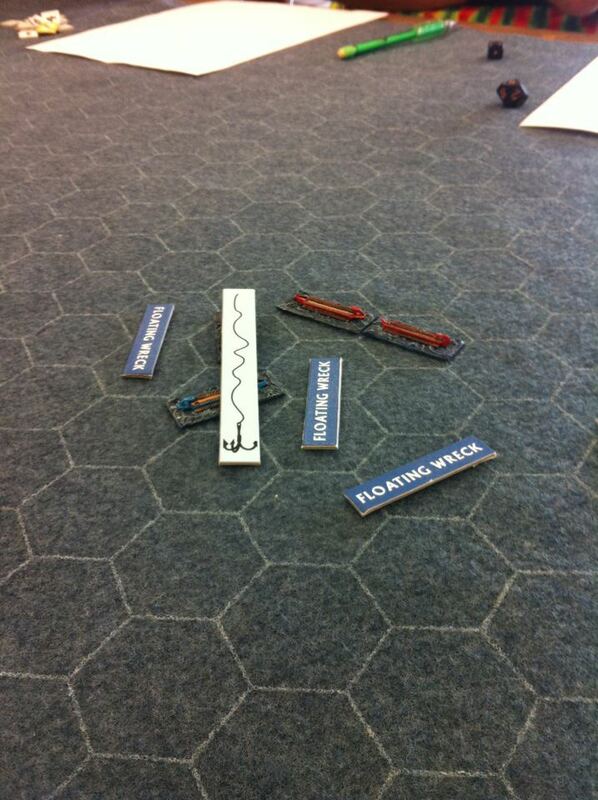 I did however manage to set up the table for the Trojan War game. It's a basic set up with Greeks and Trojans, each with three "divisions" of various types of units facing off each other over an open plain. I plan to use very basic stats for the several types of units - formed infantry, archer skirmishers, javelin skirmishers and chariotry. Only the Myrmidons have a special rule - "Tough Fighters" as well as being "Stubborn." I added the 6 Dendra guys for the heck of it as a Tiny unit too - I may give them some special armor save though. Here are some shots of the divisions and units. 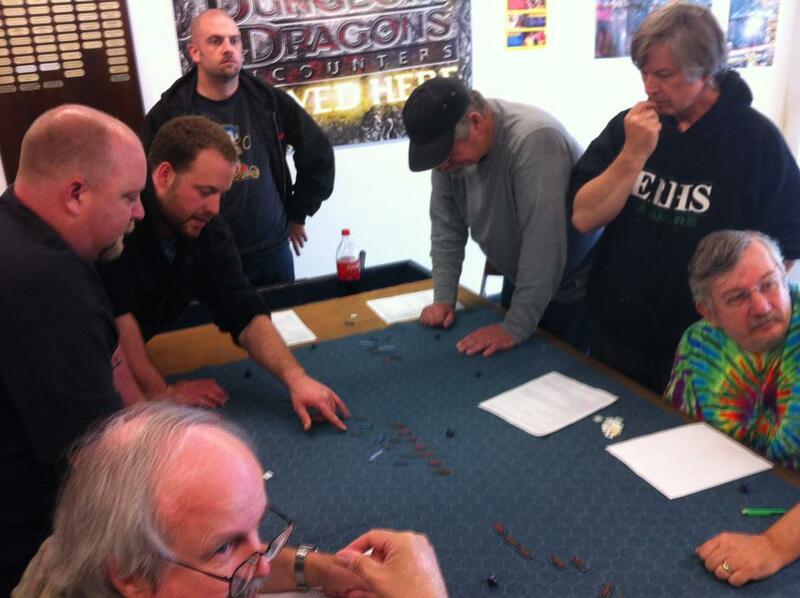 Again, this will only be a playtest to feel out the rules. Once I feel comfortable with them, I'll likely come up with a more interesting scenario. Maye one where different allies can join in after so many turns, or if a certain unit is broken. Something along the lines of Memnon and his Ethiopians (or Cissians, according to some sources), and Penthesilea and her Amazons coming on later in the game if Hector or enough Trojans are killed. Added another unit to a WAB Campanian army - bringing the points up to 3,000. It is a small unit of 12 Warriors with light armor, large shield and throwing spear. 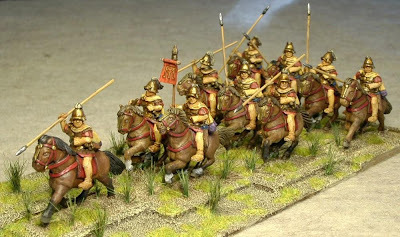 This is actually a previously painted unit that I was going to use as Veterans in a Carthaginian army. Along with the unit are standards for the two Hoplite and Aetolian peltast units, as well as the Army Standard. Next are the command figures to finish up the Hittite, Sherdan and Philistine units for Hail Caesar. The figures were given to me by fellow-TMPer Cheriton - who also traded me a bunch of Foundry Napoleonics earlier in the year. He answered my TMP trade request for some Biblical command figures. The Sherdan guy is a Black Tree Design figure and the Philistine leader and musician are Newline. The two figures in scale coats are unidentified figures. I added different legs to them to add height - the figures the legs came from are also unidentified. The head of one of them is from another BTD Sherdan with the disk on the helmet removed. The axe-wielding arm is also from an unidentified figure. Here are the two mishmashed figures prior to painting. Although the BTD guy is a bit larger than the Old Glory figures, and the Newline a little smaller, they look okay in the units as command figures. I should be able to host a Hail Caesar playtest soon. On the home front, my oldest boy flies out for Air Force basic training tomorrow morning. He just graduated from high school with honors (including Presidential Scholar) a couple of weeks ago. After basic, he will immediately begin his technical school (what the Air Force calls their advanced individual training) - he is due to graduate that course end of March 2013. He will have a two week break during Christmas - will we surely miss him until we see him again. Finally got the motivation to finish these guys - and glad I did. Here they are on some beautiful Hotz Works mats. Eric sent me a bunch of these mats to sample and I am proud to post them here on my blog. The are truly nice pieces and as with all of his works, of the highest quality. Oh, and the Front Rank guys are also top-notch. I am happy to say that they are a pleasure to paint as the details are not only excellent, but have the painter's brush in mind. The lances are brass rod with hammered spear heads. The pennons are made from a basic design found on the internet and printed out on plain bond paper - I did add some highlights to them though. The eagle is from a spare Old Glory 2nd Edition guy. The horses were sprayed with Krylon Brown Boots - which I found at the local Walmart. It works perfect for a base coat color for horses. I will be using it a lot in the future. This what they looked like prior to a stain of Minwax Tudor Satin. I gave them a finish of Testors Dullcote when dried. No other highlighting was added. Of course, the musician's horse was given a base coat of white. Without a doubt, using the Krylon Brown Boots spray and Minwax stain is the fastest, and easiest way to get horses done. BTW, the Imperial Eagles on the horse blankets were painted for effect, rather than accuracy. 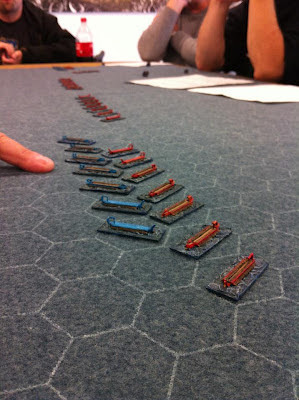 Using existing units, I came up with a 2,800 point WAB Campanian army. It looks pretty potent on paper - for instance the Oscan Horse have WS 4 and can take several types of allies including Pyrrhic forces. In the photo above, starting from the right flank - first row: Pyrrhic Guards as Light Infantry with thrusting spear and javelins, Aetolian Peltasts and Cretan archers; second row: two units of Hoplites in phalanx formation with thrusting spear and large shield, and a unit of Warriors (Light Infantry) with javelins; last rank: Oscan Horse with light armor, shield and javelins, Army Standard (still needing an appropriate one), Army General, and another unit of Oscan Horse, this time with light armor, shield and thrusting spear. This unit of Oscan Horse was converted from A&A Macedonian Companion Cavalry. Added some shields and swapped their xyston with thrusting spears. All the shields are plastics from a Wargames Factory Numidian Light Infantry box - they are attached using tack putty and can be removed without damaging the paint on the figure. The standard is also from the Numidian set; LBMS transfers are added to to the shields - luckily I had just enough left over from past projects. The Army General is the Pyrrhus figure by Relic. The Hotz mats I ordered just about a week ago have arrived! Thanks for the quick shipment Eric! 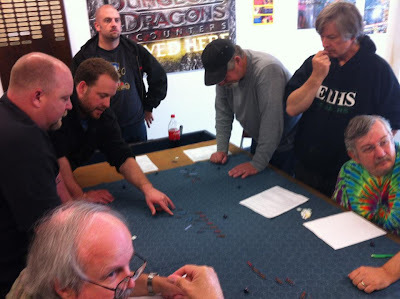 Here is one that will be used for a set of home grown rules that Bruce M. of Company B came up with. Actually, the rules are for his "Bots" game using robots, but can easily be adapted for gladiators. This is the larger (23.5 X 23.5") Sand Brown version that is bit richer in color than in the flash-washed photo. This is the Sea Blue-Gray mat with 1.5" hexes. The mat is 72 x 45" and should be large enough for the 60-odd 1/1200th ships I have. Plan to use it next Friday at one of our annual Truants games - this is the third year the few of us who don't work on Fridays (at least during the summer for our educators, Kevin and Mark) meet for ad hoc gaming. For the naval game next week, I'm thinking of trying out either Delos or Diodochi, a couple of free rulesets that are listed on the Roman Seas website. I think they may work better for the scenario - larger fleets (30-plus per side) and no player experience. 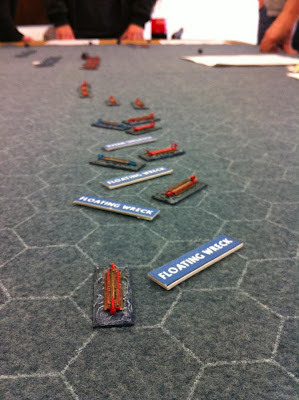 Not to mention the GM, me, being quite the novice with Roman Seas. Here are six units for Hail Caesar - of course, they can also be used for other rules, but I want to give Hail Caesar a try. Five of the units actually still need a figure each; the Sherdan bag came with an extra figure - which sometimes happens with Old Glory. I also picked up some Front Rank Guard Lancers from a TMP sale. Plan to paint them up as Dutch Lancers - might even give them a basecoat of red spray paint.